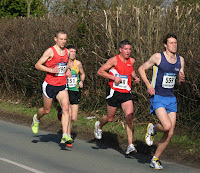 Trafford 10k Sunday 15th March. 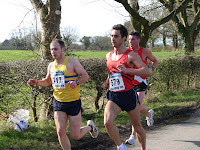 The Trafford 10k did not disappoint with its reputation of a PB course, with both Alastair Murray 48th in 33.14 and Guy Heyes 54th in 33.37 proving. Ali was getting the races in before the probable onset of a period of reduced leisure time, with wife Karen due their first child in a few weeks. Guy however is now well experienced at organising his leisure time with a baby sitter allowing both Lisa and himself to race, with Lisa very pleased with her 36.57 and the addition of more vouchers to her tally, this time as first 0/35. 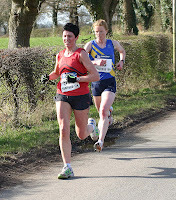 Racing up front was particularly fast with first lady Michelle Ross Cope clocking a fine 32.45. 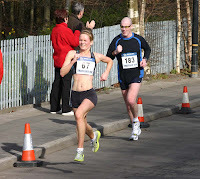 Katie Ingram was happy enough with her 34.07 even though missing out on a PB. 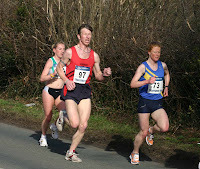 Andy Neary and Karl Ward made up the Horwich contingent with Andy not particularly chuffed with his 35.47 for 49th and Karl satisfied with 36.24 for 90th.